Let's face facts: The primaries are all over but the shouting. In dark corners of the internet, you can still find, even after Clinton has pulled ahead by some 302 pledged delegates, some diehard Bernie supporters who think they can win the remaining states by the 65% or so they will need to pull ahead in pledged delegates. Some are even hoping for an indictment over Hillary's emails so that Sanders can win. That is so wrong-headed that I won't even address it, but for some Bernie supporters, it is their last hope on a sinking ship. This post is not intended to drag down Bernie. I won't play those kind of political games. As I previously posted, I was "feeling the Bern" early on in the primaries. But I felt Bernie was far too light on foreign policy, and had no specifics on how he would implement his policies, especially in the face of a hostile, dug-in House. Even so, if he somehow got the nomination, I would most certainly vote for him. He is infinitely better than Trump or any other potential Republican nominee. And so is Hillary. Whatever anyone feels about her, she would be infinitely better than Trump, who just last night said that if Hillary was a man, she'd have less than 5% of the vote. If you want a sexist pig in the White House, the surest way is not to vote for Hillary. Since this is primarily an education blog, allow me to discuss that first. The main kick against her is that she allegedly said she would close half of all public schools, which was taken out of context. She specifically said that this is a state's issue, and she's not closing any schools. Furthermore, she lays out a fairly comprehensive K-12 education plan that supports and protects teachers. She also wants to implement a comprehensive pre-K program--something that would have a direct positive effect on all children, but especially disadvantaged children. As far as I can tell from his website, Bernie has no specific policies to help teachers or children. He wants to provide free college for all, but has no plan to get students there. And then, there's the Supreme Court. If Trump wins, you can expect at least 2-3 Republican justices, which will result in the elimination of tenure, the demolition of unions, and likely a return to an NCLB-like environment. Speaking of the Court, you can also expect an elimination of women's and LGBT rights, right-to-work states nationwide, a reversal of Roe v. Wade, and a continuation of Citizens United, which is a core plank in Bernie's platform. What else can you expect from a Trump presidency? Let's start with an elimination of the minimum wage, the deportation of 12 million illegal immigrants, women thrown in jail for having abortions, allowing countries such as Japan and South Korea to have nuclear weapons, tens of millions losing their insurance, a destruction of Social Security through privatization, and a tax policy that will punish the poor. And that's for starters. Of course, you may vote for anyone you wish. But don't kid yourself; voting for anyone but Hillary is a vote for Trump. If you believe that you are in a blue state (as most of the readers of this blog are) so voting third party or writing in Bernie won't matter, you are simply wrong. First of all, it is not a given that the Democrat will always win blue states. In addition, it is incredibly important that we get a Democrat in the White House with an overwhelming mandate from the electorate, along with a Congress that will support that person. That is true whether Clinton or Sanders wins. I understand the disappointment that Sanders' supporters feel. I've been there with candidates myself. 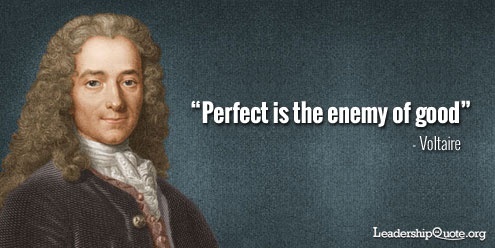 But even if you believe Sanders to be superior to Clinton, it would be wise to heed Voltaire who famously said, "Perfect is the enemy of good". As Bernie's ship sinks, don't forget the millions of people drowning in the Republican waters. The millions of immigrants, women, LBGT people, and union workers need you to throw them a life-saver. To deny it to them in the name of philosophical purity is to doom them to the fate Trump envisions for them.